You’re in the park and on a mission — gotta find those characters. Gone are the times when your day would include a couple character meets unexpectedly. Between guests clamoring to see their favorites and the parks being more crowded, character meet and greets are much more organized. 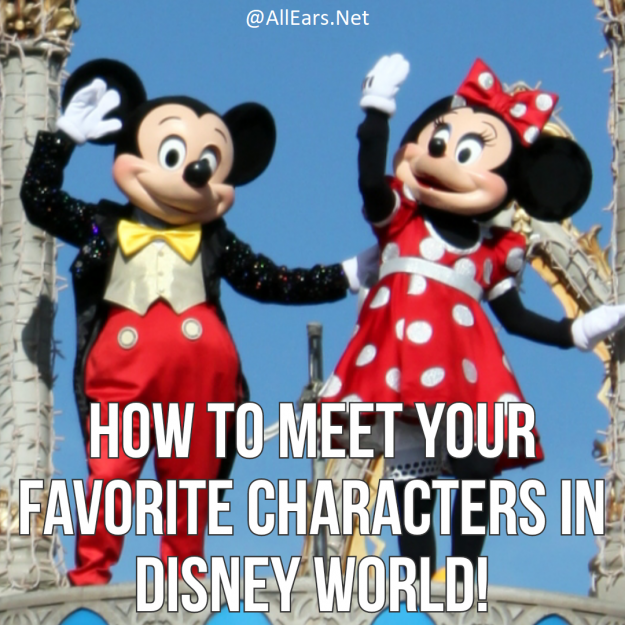 In fact, you can get a FastPass+ for a number of character meet and greets! How do you find the Characters and what do you do when you get there? For those characters you MUST see – we recommend getting a FastPass+ (no additional expense) or reserving a Character Meal (additional cost). Scroll down for FastPass+ Character Meets. Read the Times Guides — Each of the four theme parks (Animal Kingdom, Epcot, Magic Kingdom and Disney’s Hollywood Studios) provide Times Guides that include character greeting times and locations. Finding Characters in Epcot – Daisy Duck appears just inside the Main Entrance to the right of Spaceship Earth. Also in Future World is the “Epcot Character Spot ” meet-and-greet across from Innoventions West. Mickey and Pals (usually Minnie and Goofy) are located in the Character Spot itself. Across the way you can find Baymax in one area and Joy and Sadness nearby. Lines for both, especially Joy and Sadness tend to be long. You can find a variety of characters throughout World Showcase (Anna and Elsa in Norway, Aladdin in Morocco, Snow White in Germany, and so on). BONUS: There are three areas in Epcot that you MAY occasionally find characters that are “in rehearsal.” Places to watch include: 1) International Gateway area near the shops; 2) American Adventure off to the left near huge gate as you face the pavilion; or 3) World Showplace. Characters at Animal Kingdom – Mickey and Minnie can be found in the Adventurers Outpost in Discovery Island. In Discovery Island you will also find an assortment of characters spread around including Flik, Tarzan, Pocahontas, and Russell from Up (check times guide). For the most unique experience, be sure to find DiVine, the wandering vine. She is amazing to watch. Goofy is generally in Dinoland, King Louie and Balou in Asia, and Rafiki in Conservation Station. Characters at Disney’s Hollywood Studios – Several times during the day, the characters emerge from backstage and spread around for meet and greets in front of the Great Movie Ride. Buzz Lightyear and Woody are available at Pixar Place, across from Toy Story Midway Mania. A few Star Wars characters are available at Star Wars Launch Bay. Along Hollywood and Sunset Boulevard you may find the Citizens of Hollywood. These amazing folks have been bringing their own version of laughter to the Studios for many years. If you see them, go and interact, have yourself a fun time! Characters at Magic Kingdom – Various characters are around the Town Square area in the morning when you enter. Mickey and Tinker Bell can be found in the Town Square Theater. Merida has her own themed meet and greet. The Magic Kingdom offers FastPass+ for several of the characters. Pete’s Silly Sideshow in Fantasyland is the home to Donald, Daisy, Goofy and Minnie in unique costumes. Each of the themed areas of the park have related characters who are happy to see you. The times guide will give you detailed information. Special Disney Visa Credit Card Character Experiences at Epcot and Disney’s Hollywood Studios. You MUST present your Disney Visa Credit Card for entrance! Epcot – Look for the character experience at the Imagination Pavilion area, to the left of the Pixar Film Festival. A special character experience is available from 1 to 7 p.m.
Disney’s Hollywood Studios – A special Imperial Encounter is inside the Launch Bay, ask Cast Members to direct you from 11 a.m. – 4 p.m.
Use Guest Relations — Guest Relations at the parks are very useful (City Hall at the Magic Kingdom). They have numbers they can contact to see where everyone will be making appearances. If your child has been aching for a photo with Donald Duck, when you arrive at the park in the morning, your best bet would be to go to Guest Relations. They can find out for you where the good spots are to spot that duck. These schedules are always subject to change, but there’s a good chance of finding your favorites this way. Still stumped? Use your friendly neighborhood Cast Members — Cast members have a phone number to call if you want to know where a specific character should be. However, if you’re just looking to see as many as possible, or just see who you might run into, you can. Woohoo! There they are! Um, now what? Lining Up — OK, you’ve found out where your desired character is, now how to get to that character. Waiting at the entrance they come out at is not recommended. Pluto needs his space just like everyone else. If you find out they’ll be coming out at 4:50 p.m., try to arrive about 5 minutes prior. At Magic Kingdom if a line begins to form, they set up queues. TIP: Ask a cast member at the beginning of the line, or at the end, before you go in, who is there. They will tell you who is scheduled for that day. Be ready — That means having those pens ready, those books open, your cameras ready, and your video cameras rolling! By all means, take the lens cap OFF. Don’t have your camera turned around backwards and take a picture of your (now blinded) face. Don’t forget to put your name and address or hotel in the autograph book. You’d be surprised how many are lost. Try to find “thicker” pens — remembering some characters have gloves on. Ink pens are best for autograph books and other regular paper products. The brand Sharpie offers a felt tip writer that is “fat” and good for autographing most items in the hat, shirt, poster category. It comes in blue, black and other colors. Be flexible — Some of the cutest pictures I’ve seen have been of a small child staring up in wonder at the life-sized Winnie the Pooh standing over him/her. In other words, not every picture has to have everyone looking at the camera. Sometimes a child will not look at you, no matter how long you sit there like a stuck record: “Honey, look here. Look up at Mommy. Look at the camera. Sweetie, say cheese. Look up for the picture. Honey…” Also, do not force your child. If he or she is frightened, do you really want a picture of a terrified child in tears, just so you can “prove” he or she saw Mickey? Characters Take Breaks TOO! – They need a snack or a break from the heat just like you do. The character you get in line for may not be the one you actually see. Have part of your group get in line and then go ask the Character Greeter for information. Listen to the greeter — When they say Minnie is going to be back in 5-10 minutes after she powders her nose, that means just that. She will be back soon. Don’t ruin your day by causing a scene. Curiously, this is more often the parents than the children. Be Nice — I must admit, Pluto sure does look like a walking jungle jim. Everything from his ears, nose, and tongue down to his tail are easy to hang on. But these characters gotta be safe and in good shape for meeting so many people every day. Be nice to them and they should be nice back. Pluto does like getting scratched behind the ears. Donald loves to get kisses on the beak. Tigger loves to Bounce! Be Considerate! to both the other guests wanting to get to the characters and to the characters themselves! When a character needs to leave an area, it does not mean they have personally singled you out to be mean to. Characters can only stay out for a certain time and it’s really important that they leave when the greater tells them it’s time. Please DO NOT grab the character(s) and demand that they stay for you. Signing clothing — Yes, the characters will do it. However, do not WEAR the item of clothing you wish to have signed. The characters cannot sign anything *while it is being worn. * Please also note that a ballpoint pen does not write well on a t-shirt. Hats are good to have signed, just remember that having a blue pen and writing on blue fabric isn’t the easiest to do. If you want hats or any cloth signed, markers will work best, especially Sharpies (which come in a variety of colors). These work great on banners and photos, too! Why do those crazy characters do the things they do? Group Photos — At some point, you will hear someone ask if they can get a picture of two or more characters together. 99% of the time, the answer is no. This isn’t the answer the person was hoping to hear, but the reasoning is that once one picture is taken like that, *everyone* is going to want one like that. Unfortunately, while this makes for a lot of cute pictures — it also makes for a lot of unhappy kids because they didn’t get to see the characters as there wasn’t enough time. Getting one picture with each character is a lot faster. Holding Children — “Can [insert character name here] hold my child?” No. Nope, sorry, no way. The characters can be a little … clumsy. You really don’t want Pooh dropping your child, no matter how cute the picture would be beforehand. But perhaps, the character might be able to sit on the floor and have your child on their lap. CAUTION. MAGIC SPOILERS AHEAD. PLEASE DO NOT ALLOW SMALL CHILDREN TO READ, OR EVEN BIG KIDS WHO STILL HAVE THEIR PIXIE DUST. I’m not sure why people feel the need to ask these questions, but they do. These questions are heard every day, many times a day. In the hopes of avoiding seeing those precious little faces fall when they overhear some adult bent on crushing the magic… Ok, soapbox mode off. Is it hot in there? Yes. In a word, yes. I have to laugh at how many people think there are personal air conditioning units inside. Where in the world would they go? But this is why the characters are only out for short times — from 20 to 45 minutes, depending on location and time of year. When Pluto has to go get a drink, please let him go. He will be right back. Depends on which character. Look at what they’re wearing. Beast wears a bit more than oh, say, Minnie. But suffice it to say it’s a bit heavier than your t-shirt, shorts, and fanny pack. Are you a boy or a girl in there? This one astounds me. But in the interest of answering questions, look at body size and guess. Looking at Goofy, how many females do you know around 6 feet tall? Same goes for the mice. Know many small frame, 5 foot guys? As for the middle range characters, you never know. Please don’t try to squeeze the arms or hands to feel body size. Please, please, please have fun. That’s what you’re there for, right? Play with the characters. Interact with them. Don’t focus so much on the autographs. Just have a good time. Since my son is too young for an autograph book, we brought 8″x10″ photo mats for the characters to sign. I bought two, one for Chef Mickey’s and one for Crystal Palace, and markers for the characters to use. Once I got home, I put a picture for our group at the restaurants and they are now proudly displayed in our home. It is a great way to display the autographs and a wonderful way to remember the magic with my son. – Megan P.
Since my 4 year old daughter was most interested in meeting characters, my big tip would be to go to the character meals at odd hours. AllEars.net thanks many cast members at Walt Disney World for their help with this section.